One of the things I love about being an Italian-American and a member of the legal community is the honor to serve The Justinian Society as Chancellor. The Justinian Society is an organization of Italian-American lawyers, judges and law students that was founded in 1935 in Philadelphia. 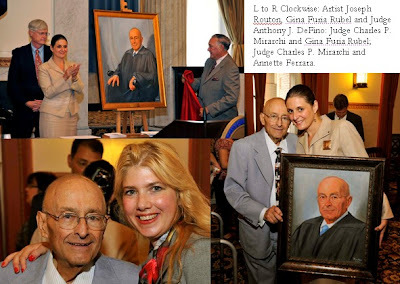 On September 21, 2009, I had the honor to participate in a portrait unveiling for the Honorable Charles P. Mirarchi – who is not only a trailblazer in the legal and judicial communities – but who was a family friend long before I was born. Dan Cirucci did a great job reporting on the evening in his blog. And Annette Ferrara summed it up in her words just perfectly – yes – it takes a man of great character. And I add: it takes a man of great principle to always lead by example, to provide selfless counsel, and to be loved by most everyone he has ever come in contact with. Thank you, Judge Mirarchi, for always being that man. Here are some photos from our official photographer, Mike Mountain.